4-10B-Borono-2-18F-fluoro-l-phenylalanine (18F-FBPA) was developed for monitoring the pharmacokinetics of 4-10B-borono-l-phenylalanine (10B-BPA) used in boron neutron capture therapy (BNCT) with positron emission tomography (PET). The tumor-imaging potential of 18F-FBPA was demonstrated in various animal models. Accumulation of 18F-FBPA was higher in melanomas than in non-melanoma tumors in animal models and cell cultures. 18F-FBPA was incorporated into tumors mediated mainly by L-type amino acid transporters in in vitro and in vivo models. Tumoral distribution of 18F-FBPA was primarily related to the activity of DNA synthesis. 18F-FBPA is metabolically stable but is incorporated into melanogenesis non-enzymatically. These in vitro and in vivo characteristics of 18F-FBPA corresponded well to those of 10B-BPA. Nuclear magnetic resonance and other studies using non-radioactive 19F-10/11B-FBPA also contributed to characterization. The validity and reliability of 18/19F-FBPA as an in vivo probe of 10B-BPA were confirmed by comparison of the pharmacokinetics of 18F-FBPA and 10B-BPA and direct measurement of both 18F and 10B in tumors with various doses of both probes administered by different routes and methods. Clinically, based on the kinetic parameters of dynamic 18F-FBPA PET, the estimated 10B-concentrations in tumors with continuous 10B-BPA infusion were similar to those measured directly in surgical specimens. The significance of 18F-FBPA PET was verified for the estimation of 10B-concentration and planning of BNCT. Later 18F-FBPA PET has been involved in 10B-BPA BNCT of patients with intractable tumors such as malignant brain tumors, head and neck tumors, and melanoma. Usually a static PET scan is used for screening patients for BNCT, prediction of the distribution and accumulation of 10B-BPA, and evaluation of treatment after BNCT. In some clinical trials, a tumor-to-normal tissue ratio of 18F-FBPA > 2.5 was an inclusion criterion for BNCT. 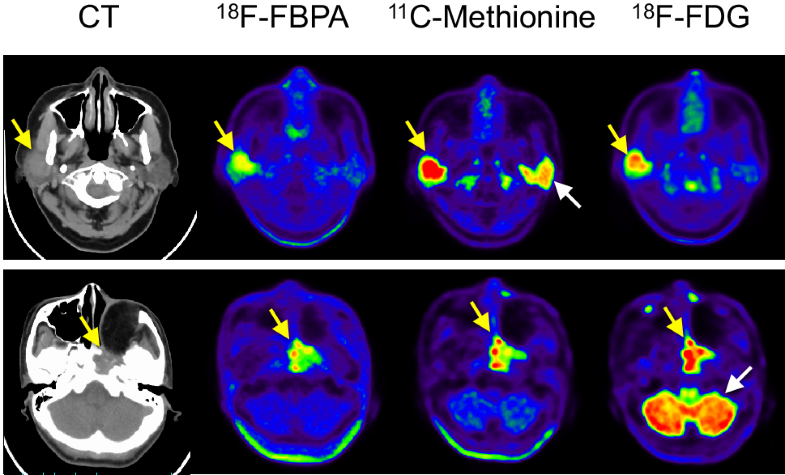 Apart from BNCT, 18F-FBPA was demonstrated to be a useful PET probe for tumor diagnosis in nuclear medicine: better tumor-to-normal brain contrast compared with 11C-methionine, differentiation of recurrent and radiation necrosis after radiotherapy, and melanoma-preferential uptake. Further progress in 18F-FBPA studies is expected for more elaborate evaluation of 10B-concentrations in tumors and normal tissues for successful 10B-BPA BNCT and for radiosynthesis of 18F-FBPA to enable higher 18F-activity amounts and higher molar activities. Boron neutron capture therapy (BNCT) is a radiotherapeutic technique that selectively treats tumor cells with high-energy α particles and recoiling 7Li nuclei via 10B(n,α)7Li produced by the neutron irradiation of 10B-containing compounds located selectively in tumor tissues. The preferential characteristics of boron delivery agents for BNCT comprise high tumor uptake for several hours, relatively rapid clearance from blood and normal tissues, and low toxicity. So far, only two 10B-compounds have been used clinically, sodium 10B-borocaptate (Na2BI2H11SH or BSH) and 4-10B-borono-l-phenylalanine (10B-BPA), although a large number of 10B-compounds have been synthesized for over 50 years [1, 2, 3, 4]. 10B-BPA is taken up by tumor tissues mainly by an L-type amino acid transporter (LAT), whereas BSH lacks such a tumor-specific uptake system and is taken into tumors by diffusion. To date, 10B-BPA appears to be in greater use in early clinical trials because of its very low toxicity and differential target/non-target extraction. It has been noted, however, that neither of these two agents, the so called second-generation boron-delivery agents, adequately fulfill the criteria required for BNCT and that third-generation agents are under development [2, 3, 4]. 10B-BPA was originally synthesized as a possible 10B-boron-containing agent aimed at BNCT by Synder et al. . Mishima et al. investigated 10B-compounds involved in melanogenesis, and applied 10B-BPA to a patient with malignant melanoma in BNCT for the first time . Coderre et al. demonstrated that 10B-BPA could be applied to other tumors in experimental models: KHJJ murine mammary tumor, GS-9L rat glioma, and human U-87 MG glioma xenograft . For successful BNCT in patients with malignant tumors, in vivo evaluation of the pharmacokinetics of 10B-BPA is one such problem that still needs to be resolved. 4-10B-Borono-2-18F-fluoro-l-phenylalanine (18F-FBPA) was developed in 1991 as a positron emission tomography (PET) probe for imaging and the evaluation of the pharmacokinetics of 10B-BPA in vivo . After several characterization studies of 18F-FBPA using animal models in the early 1990s [8, 9, 10, 11, 12], 18F-FBPA PET has been clinically applied [13, 14, 15, 16, 17, 18, 19], and the significance of 18F-FBPA PET in BNCT using 10B-BPA has been established [1, 2, 3, 4, 20, 21, 22, 23]. However, 18F-FBPA PET has expanded to only limited numbers of PET facilities, mainly because BNCT is performed in a small number of institutes with nuclear reactors as a neutron source for BNCT. The problem of suitable reactors being located outside of hospitals makes clinical trials of BNCT very difficult. To overcome this problem, accelerator-based neutron sources for BNCT in the hospital were proposed , and the development of such accelerators is progressing . Recently, a cyclotron that generates an epithermal-neutron source for BNCT was developed [23, 26, 27], and phase I and II clinical trials of BNCT using this cyclotron are progressing in Japan. Together with these sources of progress, further basic and clinical studies on 18F-FBPA aimed for BNCT have been reported in recent years. Many reviews of BNCT including clinical studies of 18F-FBPA PET have been published; however, reviews focusing on 18F-FBPA PET, especially basic studies of 18F-FBPA, are limited in number [20, 21, 22, 23]. Furthermore, in addition to BNCT, the usefulness of 18F-FBPA PET in the general diagnosis of tumors was also reported. This review summarizes basic and clinical studies on 18F-FBPA during the last quarter century, focusing on PET radiopharmaceutical science. Regarding basic research, the findings using non-radioactive 19F-FBPA and related 10/11B-BPA are also covered. 18F-FBPA was synthesized by electrophilic substitution of 10B-BPA using carrier-added 18F–F2 produced via three routes (Fig. 1). First, carrier-added 18F–F2 was produced using the 20Ne(d,α)18F nuclear reaction and converted to 18F-acetylhypofluorite . For this production an in-house cyclotron with a relatively large deuteron beam energy (about 8 MeV and more) is required, but the activity yields of 18F–F2 are limited. Consequently, the activity amount and molar activities of 18F-FBPA were very low: 440–1200 MBq and 20–130 MBq/µmol, respectively [8, 17, 28, 29]. It was noticed that the first synthesis was done by fluorination of racemic BPA . Recently this route was re-examined in detail for the reliable production of 18F-FBPA for routine clinical use . The formulation process of 18F-FBPA is available in the other syntheses, as described below. In this synthesis, the d-isomer of 18F-FBPA and contamination by trifluoroacetic acid used as a reaction solvent were confirmed to be negligible for the first time. To obtain greater activity amounts of 18F–F2 and resulting relatively high molar activities, a second route for the production of 18F–F2 using the 18O(p,n)18F nuclear reaction with 18O–O2  and 18O–H2O was devised . This 18F–F2 can be produced using even a small proton-only accelerator. Thus, the activity yields of 18F-FBPA were improved greatly: 2000–5300 MBq [19, 33 (seemed to use BPA containing naturally abundant 10/11B-boron for 18F-FBPA synthesis)]. The third route using 18O–H2O-derived 18F–F2 achieved the highest molar activity 3700 MBq/µmol, but the activity yield of 18F-FBPA did not seem to be improved [34, 35]. 18F-FBPA synthesis via the second and third routes may be referred to as the second-generation methods. 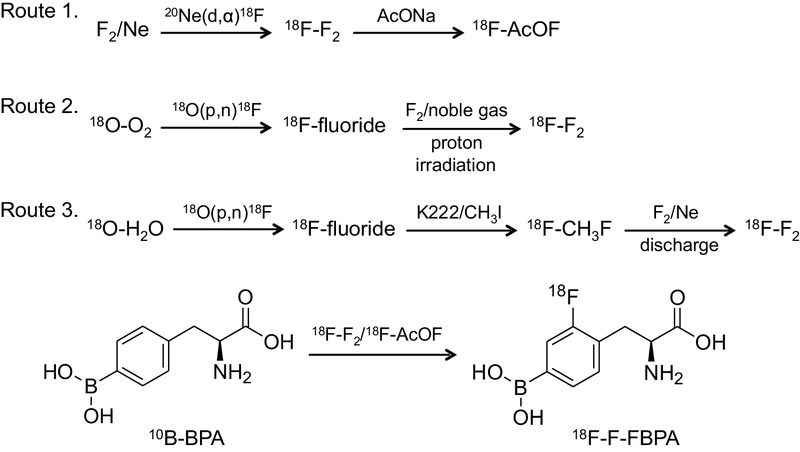 Many people anticipate the feasibility of the third-generation synthesis of 18F-FBPA by nucleophilic fluorination using no-carrier-added 18F-fluoride produced using the 18O(p,n)18F nuclear reaction. The method could hopefully achieve a high activity amount and high molar activity of 18F-FBPA as the synthesis of 18F-FDG , but this has not yet been established. In the 1990s, based on the clinical interest of Mishima and co-workers who applied 10B-BPA BNCT for patients with malignant melanoma , Ishiwata et al. demonstrated the potential of tumor accumulation of 18F-FBPA in mice with B16 melanoma and non-melanoma FM3A mammary carcinoma [9, 10] and in hamsters with Greene’s melanomas: melanotic no. 179 and amelanotic no. 178 [10, 11]. The accumulation of 18F-FBPA in these tumor models was evaluated using ex vivo γ-counting after tissue dissection. The ability of melanogenesis in tumors enhanced the uptake of 18F-FBPA. In a hamster model, melanotic no. 179 showed a 1.7-times higher uptake of 18F-FBPA than amelanotic no. 178, although both melanomas had similar metabolic activities when examined using a tracer uptake study with l-14C-methionine, 2-deoxy-d-14C-glucose and 3H-thymidine, which mainly reflect protein synthesis, glucose metabolism and DNA synthesis, respectively [10, 11]. In the mouse model, B16-F10 melanoma, which has a more highly metastatic potential and a more rapid growing rate but lower melanin content, showed lower uptake of 18F-FBPA than B16-F1 melanoma. These findings were explained by the fact that 18F-FBPA was partially incorporated in melanogenesis (see the section on the “Metabolism of 18F-FBPA”). Later, compared with non-melanoma cells, a higher uptake of 18F-FBPA in melanoma cells was also observed in vitro . Prior these studies Coderre et al. reported a higher uptake of 10B-BPA in Harding–Passey melanoma than in the non-melanoma (mammary adenocarcinoma) in mice . Ishiwata et al. used racemic 18F-FBPA in initial works [8, 9, 10], although it was known that the L-form of BPA was preferentially accumulated compared with the d-isomer . Therefore, they further clarified that uptake of the L-form of 18F-FBPA was higher than that of the d-form in B16 melanoma . Recently, similar findings were confirmed in C6 glioma-bearing rats . The heterogeneous distribution of 18F-FBPA in tumor tissues was visualized ex vivo by whole-body autoradiography of mice with B16 melanoma or FM3A mammary carcinoma [9, 10]. Later, 10B-boron distribution in the tumors after injection of 10B-BPA was visualized ex vivo directly by neutron capture autoradiography using CR-39 nuclear track detectors . In the 2000s, as technology advanced, PET imaging of 18F-FBPA in animal models was performed using high-spatial resolution PET scanners developed for small animals, although the first PET imaging was demonstrated in Greene’s melanoma-bearing hamsters with 8 mm of spatial resolution . From a clinical interest in BNCT for patients with malignant brain tumors, Chen et al. performed a pilot study estimating the kinetic parameters of 18F-FBPA in F98-glioma-bearing rats using a PET apparatus with a spatial resolution of around 1.6 mm . They measured quantitatively the forward (K1) and reverse transport rates (k2) of 18F-FBPA across the blood–brain barrier (BBB) and the anabolic (specific binding to the target) (k3) and reverse processes (k4) in tumor tissues based on a modified three-compartment physiological model [17, 18] (see the section on the “Assessment of 10B with 18F-FBPA-PET for l-BPA BNCT”). They found that tracer uptake capacity depends on K1, like in observed clinical studies [17, 18]. Later, it was confirmed that K1 is mediated mainly by LAT, especially LAT-1, in vitro and in vivo as described below [42, 43] (see the section on the “Transport of 18F-FBPA”). Regarding in vivo imaging of FBPA, Porcari et al. reported that 19F magnetic resonance (MR) imaging of racemic 10B-enriched 19F-FBPA was an alternative technique to the monitoring of 10B-BPA . Using a 7T MR-scanner they showed high accumulation of 19F-FBPA in C6 glioma in the rat brains, for which the images were superimposed on T2-weighted spin echo axial 1H images, after infusion of 19F-FBPA (300 mg/kg, no toxicity was confirmed) through the carotid artery. The signal-to-noise of each 19F MR image indicated the highest concentration of 19F at 2.5 h after infusion, and the concentration decreased gradually. Furthermore, quantitative 19F MR spectroscopic measurements of blood from the femoral vein show that the concentration of the total fluorinated compound decreases by approximately 22% from 1 to 2.5 h after infusion and then it remains constant until 4 h after infusion. It is notable that MR imaging has been applied to other boron containing agents such as BSH [1, 45]. Both 10B and 11B are detectable by MR technique. 11B displays a higher sensitivity and better spectral resolution than 10B. However, the longer T2 relaxation time of 10B has a detection advantage. The possibility of the 11B MR imaging of BNCT agents in vivo in a dog and a patient with glioblastoma multiforme treated with BSH  and in a Fischer rat treated with Na4B24H22S21 has been documented . Bendel et al. demonstrated the 10B MR imaging of 10B-enriched BSH in mice bearing M2R melanoma xenografts, and estimated boron concentration in kidney . Further studies of MR imaging of boron agents including BPA are being conducted, but are beyond the scope of this review. In the 2010’s several investigators using animal models bearing human cancer xenografts and high-spatial resolution PET scanners, visualized a heterogeneous distribution of 18F-FBPA in the tumor [40, 49], and performed further biological studies as described below. The cellular distribution of 18F-FBPA in mice bearing two B16 melanoma sublines and FM3A mammary carcinoma was investigated using double-tracer microautoradiography . The greatest amount of 18F-FBPA was observed in S phase melanocytes and the lowest amount was found in non-S phase non-melanocytes. 18F-FBPA accumulation was primarily related to the activity of DNA synthesis, as evaluated using [3H]thymidine, and secondarily to the degree of pigmentation in melanocytes. Prior to this study, Coderre et al. compared the tumoral distribution of 10B-BPA (neutron capture radiography) and 3H-thymidine (autoradiography) in Harding–Passey melanoma bearing mice. They found that the highest concentrations of l-BPA in the tumor corresponded closely with areas with high 3H-thymidine incorporation . Notably, Bailey et al. found using flow cytometry that 24–72-h exposure to racemic FBPA increased the incorporation of bromodeoxyuridine into glioblastoma cells, suggesting that FBPA might directly affect the DNA synthetic pathway of tumor cells . They considered that the previously reported increase of incorporation of FBPA in DNA synthesizing cells [12, 38] may actually reflect the action upon the DNA synthetic pathway of target cells. Using human glioblastoma T98G cells, Chandra et al. visualized the cellular distribution of 19F-10/11B-FBPA prepared from l-BPA containing naturally abundant boron (80 atom% 11B, 20 atom% 10B) and 10B-BPA (> 95 atom% 10B) at the same dose using ion microscopy coupled with confocal laser scanning microscopy [secondary ion mass spectroscopy imaging] . The mitochondria-rich perinuclear cytoplasmic region exhibited significantly lower 19F-fluorine and 11B-boron signals than the remaining cytoplasm and the nuclei, and ion microscopy observations revealed a nearly 1:1 distribution of 19F-fluorine and 11B-boron in subcellular compartments. This finding suggested that defluorination or decomposition of 19F-FBPA did not occur in tumor cells. No significant difference in the cellular localization of 11B-boron or 10B-boron was observed between the 19F-10/11B-FBPA and 10B-BPA. The tumor imaging potential of 18F-FBPA was compared with other PET probes. Tumor uptake of racemic 18F-FBPA was similar to that of 11C-methionine in FM3A mammary carcinoma bearing mice . In F98-glioma-bearing rats, tumor uptake of 18F-FBPA was lower than that of another artificial 18F-labeled amino acid derivative, O-2-18F-fluoroethyl-l-tyrosine, but the tumor-to-normal brain (T/B) ratios were rather higher . Tumor uptake of 18F-FDG was much higher than that of these two 18F-labeled amino acids when dissecting tissues and measuring using γ-counter; however, the high uptake of 18F-FDG in the normal brain gave blurred brain tumor images. Watabe et al. compared 18F-FBPA, 11C-methionine, and 18F-FDG in a rat xenograft model of C6 glioma . Tumor uptake values of 18F-FBPA and 11C-methionine were similar and lower than that of 18F-FDG, whereas the uptake values of 18F-FBPA and 11C-methionine in turpentine oil-induced inflammatory lesions were significantly lower than that of 18F-FDG. These findings suggested the usefulness of 18F-FBPA and 11C-methionine for differentiating between tumor and inflammation; however, differences in tumor-to-inflammatory lesion uptake ratios were not especially large in this model: 18F-FBPA, 1.7; 11C-methionine, 2.1; and 18F-FDG, 1.6. Wittig et al. reported that 10B-BPA is transported in rat 9L gliosarcoma cells and Chinese hamster V79 cells by a LAT based on the findings for 10B-BPA import and efflux measurements in the presence of system L- and system A-specific substrates . Among the system L family, particularly LAT-1, which is highly expressed in malignant tumors, may play a major role in the effectiveness of 10B-BPA in BNCT . Wongthai et al. evaluated the subtype specificity. Km values of 10B-BPA for ATB0,+, LAT-1 and LAT-2 (mainly expressed in normal tissues) were 137, 20, and 88 µM (LAT-2/LAT-1 = 4.3), respectively . Regarding the transport of 18F-FBPA, Yoshimoto et al. found that 18F-FBPA was incorporated mainly into three human glioblastoma cell lines (74.5–81.1% of total uptake), by LAT . 18F-FBPA uptake was decreased dose-dependently to 2.1–7.1% of control by 1 mM 10B-BPA. They also found that the contribution of LAT to 14C-methionine uptake was 48.3–59.4%, and suggested that 11C-methionine PET might overestimate the concentration of 10B-BPA in tumor tissues. Watabe et al. also demonstrated that 18F-FBPA uptake was specific for LTA-1 in human embryonic kidney 293 cells (HEK293). Km values of 18F-FBPA for LAT-1 and LAT-2 (normal cell type transporter) were 197 and 2810 µM (LAT-2/LAT-1 = 14), respectively. These findings suggested that 18F-FBPA is more specific for LAT-1 than 10B-BPA  and that 18F-FBPA is taken up less by tumor and normal tissues than 10B-BPA. The tumor-to-normal tissue (T/N) ratios of 18F-FBPA PET may be different from those of 10B-BPA in BNCT. Metabolic pathways of 18F-FBPA are summarized in Fig. 2 based on the results of early animal studies [9, 10]. In general, it is considered that the artificial amino acids are not incorporated into proteins. In non-melanoma FM3A mammary carcinoma, most 18F-activity was detected as 18F-FBPA over 6 h post injection, and the protein-binding fraction was negligible, whereas in B16 melanoma considerable amount of 18F-activity were detected in the protein-binding fraction (27% by 6 h), suggesting the involvement of 18F-FBPA in melanogenesis, as shown using double-tracer microautoradiography above . On the other hand, the protein-binding fraction in plasma increased with time after injection of 18F-FBPA . This finding suggested the deboronation of 18F-FBPA in vivo. In the liver, phenylalanine 4-monooxygenase may convert 18F-FBPA to 2-18F-fluoro-l-tyrosine, which was used in the synthesis of plasma proteins secreted into the blood stream . Even if 2-18F-fluoro-l-tyrosine is re-circulated from the liver into the blood stream, it may make only a minor contribution to the total 18F-activity in tumor tissues. These findings suggested a slight discrepancy between the concentrations of 18F-activity and 10B in the animal studies to a certain extent, as described below. Regarding the metabolic change of BPA, Bendel et al. reported that the borate group was partly cleaved from BPA in the 10B MR analysis of human urine samples periodically collected from patients with head and neck squamous cell carcinoma . No further studies on the metabolism of 18F-FBPA have been reported except for the work of Grunewald et al., in which plasma metabolites were analyzed for kinetic analysis of 18F-FBPA PET in tumor-bearing mice (> 96% unchanged 18F-FBPA in plasma at 60 min post injection) . Clinically, three groups confirmed unchanged 18F-FBPA to be > 94% in plasma up to 50 min in dynamic 18F-FBPA PET [17, 34, 59], suggesting that 18F-FBPA is stable in humans at least as measured by PET. Several studies have indicated that FBPA and 10B-BPA exhibit similar pharmacokinetics and that 18F-FBPA can become an in vivo probe to monitor the behavior of 10B-BPA. Ishiwata et al. compared the 10B concentrations estimated by two methods in B16 melanoma-bearing mice and Greene’s melanoma-bearing hamsters after intravenous injection of a mixture of 18F-FBPA (1.0–2.6 mg/kg) and 10B-BPA (14–80 mg/kg) . First, 10B derived from both 18F-FBPA and 10B-BPA was measured directly by inductively coupled plasma atomic emission spectroscopy (ICP–AES). Second, 10B was calculated from 18F-activity measured ex vivo using γ-counter and the molar activities that were determined as the 18F-activity per summed mass of 18F-FBPA and 10B-BPA based on the hypothesis that 18F-FBPA and 10B-BPA behave as the same compound in vivo. The 10B concentrations calculated from 18F-activity were comparable with those measured by ICP–AES in Greene’s melanoma but much lower in B16 melanoma. The discrepancy was larger in blood and muscle. The findings indicated that the 18F-FBPA was useful as an in vivo probe of 10B-BPA, although species or tissue differences exist to a certain degree between 18F signals and 10B concentrations. Wang et al. showed that the time courses of 10B-BPA and 18F-FBPA measured ex vivo by ICP–MS and γ-counting, respectively, were similar in F98 glioma and normal brain with maximal levels at 1 h, when different doses of 18F-FBPA (0.5–0.8 mg/kg, estimated by the author) and 10B-BPA (172 mg/kg) were separately injected into two groups of F98 glioma-bearing rats . However, a certain discrepancy was again observed between T/B ratios of 10B concentration in the two groups and between T/B ratios of 10B and those of 18F in rats given 18F-FBPA. SUV (standardized uptake value) is defined as (18F/ml tissue) × (g body weight/total injected 18F). However, this formula was determined to fit the 18F signal to 10B concentrations in the rat model, and cannot be applied to other species. Watanabe et al. compared biodistributions of the same doses (500 mg/kg) of 10B-BPA and 19F-FBPA given separately in two groups of SCC-VII-bearing mice according to two administration protocols: subcutaneous injection and continuous subcutaneous infusion . No difference between 10B-BPA and 19F-FBPA was noted in the time course of 10B measured by ICP–AES in tumor or normal tissues with the same administration protocol. However, the continuous-infusion group showed lower normal tissue-to-blood ratios of 10B than the subcutaneous injection group, whereas the ratios of tumor to brain, tongue, and muscle were larger in the continuous-infusion group than in the subcutaneous injection group. The 10B concentration in the blood, rather than in normal tissue such as muscle, is often used as the reference to calculate the 10B concentration in tumors for BNCT . Lin et al. found that the tumor-to-blood and tumor-to-muscle ratios of 10B (measured ex vivo by ICP–AES) were variable at the time of measurement, but the muscle-to-blood ratio of 10B remained constant about 1.31 at 30–45 min after intravenous injection of 10B-BPA (400 mg/kg) into mice bearing SAS human oral carcinoma xenografts . They suggested that 10B concentrations in tumor and normal tissues be estimated using the normal tissue-to-blood ratio as a conversion factor (1.31 in this animal case). They recommended that before BNCT of patients the T/N, the tumor-to-blood, and normal tissue-to-blood ratios be determined using 18F-FBPA PET. Grunewald et al. also indicated the equivalent tissue distribution patterns of different administration doses of 18F-FBPA (1.5 mg/kg) and 10B-BPA (200 mg/kg) in tumor-bearing mice . The 10B concentration was analyzed ex vivo by prompt gamma activation analysis or quantitative neutron capture radiography. The organ-to-plasma ratios of 10B were well correlated with the organ-to-plasma ratios of 18F-activity measured ex vivo using γ-counter (y = 0.83x + 0.75; r = 0.93, p < 0.0001), and also well-correlated with the organ-to-heart ratios of 18F-activity measured in vivo by last PET frame (y = 0.76x + 0.28; r = 0.83, p = 0.0001). Because it is assumed that the heart 18F-activity represents mainly blood 18F-activity, the organ-to-plasma ratios of 10B could be estimated by the organ-to-heart (blood pool in left ventricle) ratios of 18F-activity measured in vivo PET. Yoshimoto et al. compared the pharmacokinetics of 18F-FBPA (0.6–3.1 mg/kg, estimated by the author) by bolus intravenous injection and continuous intravenous 30-min infusion with/without 10B-BPA (250 mg/kg) using a mouse model bearing six human tumor xenografts . All six tumors showed increasing uptake of 18F-FBPA after a bolus injection. SUVs in LN-229 human glioma at 50–60 min after three administration methods were similar: bolus injection 1.26, continuous infusion without 10B-BPA 1.22, and continuous infusion with 10B-BPA 1.12. In six tumors, a significant association was revealed between tumor uptake of 18F-FBPA by bolus injection and by continuous infusion (r = 0.92, p < 0.01). 10B-Boron concentration measured ex vivo by ICP–AES in tumors correlated with 18F-FBPA uptake regardless of the administration method. For successful BPA BNCT high accumulation of 10B-BPA in tumors is essential. It has been reported that preloading with L-type amino acids such as l-tyrosine and l-DOPA enhances accumulation of l-BPA in malignant glioma and melanoma cells [48, 64, 65, 66]. When this approach was expanded to FBPA, similar enhancement phenomena were confirmed in the racemic 10B-enriched 19F-FBPA uptake in vitro in C6 glioma cells and in vivo in rats bearing C6 glioma by preloading of l-DOPA . Additionally, 18F-FBPA uptake was enhanced in human and mouse tumor cell lines in vitro by preloading of l-DOPA, l-tyrosine, and l-BPA itself . On the other hand, Grunewald et al. found that preloading of l-tyrosine, l-DOPA, and l-BPA did not increase the uptake of 18F-FBPA or 10B-BPA in any organs of mice bearing HuH-7 human hepatocellular carcinoma xenografts . Regarding brain tumors, BBB disruption may be another approach to enhance the delivery of 10B-BPA [68, 69, 70]. In F98 glioma-bearing rats that received mannitol or cereport (a receptor-mediated permeabilizer-7), the tumor 10B concentrations after intracarotid injection of 10B-BPA were enhanced compared with controls, which resulted in significantly longer survival times after 10B-BPA BNCT. Using this animal model and a mannitol-induced hyperosmotic BBB disruption technique, Hsieh et al. confirmed enhanced tumor uptake and tumor-to-ipsilateral brain ratios of both 10B-BPA and 18F-FBPA after intracarotid injection . They suggested that the pharmacokinetic parameter k12/k21 ratio (k12: rate constant of the central compartment to the peripheral compartment; k21: rate constant of the peripheral compartment to the central compartment) measured by 18F-FBPA PET may serve as a good indication for evaluating tumor uptake and tumor-to-brain ratio after intracarotid injection of 10B-BPA. It is also known that pulsed high-intensity focused ultrasound (pulsed-HIFU) is able to disrupt the BBB to improve the delivery of macromolecules, such as antibodies and liposomal drugs. Wu et al. demonstrated that this technique enhanced tumor uptake of 18F-FBPA in mice bearing orthotopic SASC03 human tongue squamous carcinoma xenografts . Immediately after pulsed-HIFU, tumor uptake of 18F-FBPA was 1.8 times that of the control at 60 min post injection; however, pulsed-HIFU did not affect the distribution of 18F-FBPA in most normal organs except the brain (3.1 times increase). The histology and expression of CD31 and Ki-67 were not changed by pulsed-HIFU. Yang et al. evaluated quantitatively the kinetics of 18F-FBPA in F98 glioma-bearing rats with pulsed-HIFU-induced BBB disruption , and found that the accumulation of 18F-FBPA in brain tumors and the tumor-to-contralateral brain ratio were significantly elevated. The K1/k2 ratio may be useful for indicating the degree of BBB disruption: K1 and k2 representing forward transport and reverse transport of 18F-FBPA across BBB. Before starting clinical studies on 18F-FBPA, radiation dosimetry was investigated in mice using racemic 18F-FBPA in a preclinical study . Later, Ishiwata and co-workers evaluated the radiation dosimetry of l-enantiomer of 18F-FBPA in adult humans by dynamic whole-body PET scanning, and indicated that the effective dose of 18F-FBPA (23.9 µSv/MBq, n = 6) in humans was similar to that of other 18F-fluorinated PET probes such as 18F-FDG, O-(2-18F-fluoroethyl)-l-tyrosine, and 6-18F-fluoro-l-dopa (19–29, 16.5, 19.9 µSv/MBq, respectively) . Kono et al. also reported slightly smaller effective doses of 18F-FBPA compared with 18F-FDG in adult and pediatric patients . The effective dose of 18F-FBPA in pediatric patients (31 µSv/MBq, n = 3) was larger than that in adult patients (15 µSv/MBq, n = 6). Imahori, Mishima, and collaborators performed initial clinical trials of 18F-FBPA PET in patients with malignant brain tumors [13, 14, 15] and metastatic melanomas . They performed dynamic PET scans with arterial blood sampling after intravenous injection of 18F-FBPA. First, Imahori et al. calculated the utilization ratio (integration of the 18F-activity that appears in arterial blood relative to the total injection dose) and incorporation constant (the amount of incorporated 18F-FBPA in the tumor tissue divided by plasma 18F-FBPA integrated over time) of 18F-FBPA, and estimated 10B-boron concentrations. The values estimated were generally higher but were very close to those measured ex vivo in surgical specimens of patients after 10B-BPA infusion by the ICP–AES . To improve the 10B estimation method, Imahori et al. determined kinetic parameters (K1, k2, k3, and k4) based on a three-compartment model (Fig. 3a) [17, 18]. K1, which is mainly mediated by LAT-1 as described above, was a major factor determining the accumulation of 18F-FBPA, but k3 did not correlate with the degree of malignancy . Subsequently, in seven patients with continuous infusion of 10B-BPA in a way similar to that used in the clinical practice of BNCT, they estimated 10B concentrations in tumors by the segmental convolution method using these rate constants, compared with those in the surgical specimens, and verified the 18F-FBPA PET method to estimate 10B concentrations . Similarly, Kabalka et al. further extended this model to a four-compartment model for 18F-FBPA PET, and determined the optimal irradiation window for effective 10B-BPA BNCT from the calculated tissue 18F-activity based on a simulated continuous infusion of 18F-FBPA using kinetic parameters . It is notable that the compartment analyses by Imahori et al. and Kabalka et al. included the retention process of 18F-FBPA or non-diffusible 18F-FBPA (expressed as k3 and k4) in malignant brain tumors in spite of the metabolic stability of 18F-FBPA because of the increasing time–activity curves for about 40 min followed by a very slow decrease. On the other hand, Havu-Aurén et al. reported that benign neoplasms showed an initial uptake of 18F-FBPA at 3–5 min post injection followed by a gradual decrease, indicating very low or negligible retention processes (corresponding to the model in Fig. 3b), and that K1 was higher than k3, suggesting that transport rather than metabolism governed the uptake of 18F-FBPA . They described that some of these benign neoplasms might be amenable to BNCT based on the results of 18F-FBPA PET. In our experience, many tumors in the head and neck showed similar time–activity curves without the retention processes, like in benign neoplasms. Only in malignant melanomas, free 18F-FBPA may be incorporated into melanin by non-enzymatic polymerization in melanogenesis (Fig. 3c), as suggested in metabolite analysis of 18F-FBPA in melanoma-bearing animal models [10, 11]. In a kinetic analysis of O-2-18F-fluoroethyl-l-tyrosine with characteristics similar to those of 18F-FBPA [75, 76, 77], it was best modeled by a reversible two-tissue compartmental model rather than a one-tissue compartmental model or irreversible two-tissue compartment model . These dynamic 18F-FBPA PET studies were a practical and clinically useful method as a prognostic and therapeutic indicator of malignant brain tumors , and were applied to planning BNCT for malignant brain tumors  and malignant melanoma . In 22 of 98 glioma patients in Finland who received BNCT, from 1999 to 2011, a kinetic model based on 18F-FBPA PET predicted + 11% and + 36% higher total weighted doses delivered to tumor and normal brain, respectively, than previously estimated doses due to the non-constant tumor-to-blood concentration ratios . 18F-FBPA PET before BNCT is useful for patient selection and prediction of the distribution and accumulation of 10B-BPA, and follow-up 18F-FBPA PET after BNCT is helpful to evaluate therapeutic effect. For effective BNCT accumulation of a large amount of 10B atoms, approximately 109 atoms of 10B per cell or 20–35 µg 10B/g, in tumor cells are required, and at the same time a high T/N10B concentration ratio of greater than 1 and preferably 3–5 is required to ensure a therapeutic dose to the tumor with a minimal background radiation dose [82, 83]. From a practical point of view, there is an easy approach for 18F-FBPA PET for screening of patients suitable for BNCT. To evaluate the T/N ratio of the 10B concentration being over 3.0 pre-BNCT, it may be sufficient to compare the T/N ratio of 18F-FBPA uptake obtained by an appropriate static scan of 18F-FBPA PET. Nariai et al. indicated that in patients with malignant brain tumors the T/B ratio of 18F-FBPA after a bolus injection of 18F-FBPA had a significant linear correlation with the T/B ratio of 10B estimated by 1-h constant infusion of 10B-BPA, as simulated using the Runge–Kutta algorithm . This type of quantitative evaluation has not been tried in other malignant tumors; however, Morita et al. recently reported that the T/N ratios of 18F-FBPA in head and neck cancers and malignant melanoma were not significantly changed over 120 min in spite of a slight decrease in 18F-FBPA uptake . In evaluating the T/N ratio of 18F-FBPA in patients with head and neck cancers, it is notable that the uptake of 18F-FBPA was higher in the dorsum tongue, submandibular gland, parotid gland, and tongue in this order among normal tissues in the oral and maxillofacial regions than in normal brain . The averaged ratios (n = 8) of T/B and tumor-to-dorsum tongue were 3.25 (range 2.34–5.40) and 1.25 (range 0.95–2.10), respectively. The ratios varied depending on the location of the tumor, type of tumor, and scan time post injection. For example, in Fig. 4a, tumor (salivary gland duct carcinoma)-to-surrounding normal tissue ratios was 3.2, whereas the tumor-to-contralateral normal salivary gland ratio was 2.3 (unpublished data). In an early study, Kabalka et al. indicated that the lung and peri-oral mucous gland showed intense 18F-FBPA activity . To predict the accumulation (concentration) of 10B-BPA in tumors, first dynamic and quantitative 18F-FBPA PET was performed as described above. On the contrary, in BNCT the 10B concentration in the blood is often used as the reference to calculate the 10B concentration in tumors . Therefore, in the practical use of 18F-FBPA PET for 10B-BPA BNCT, the 10B concentration in the tumor has been estimated by multiplying the 10B concentration in blood measured during neutron irradiation by the tumor-to-blood ratio of 18F-FBPA PET . For this purpose, Isohashi et al. proposed the use of the image-derived tumor-to-blood ratio of 18F-FBPA . They used 18F-activity in the left ventricle instead of 18F-activity in the blood, with correction for underestimation due to the partial volume effect and reduction of 18F-activity in the blood. 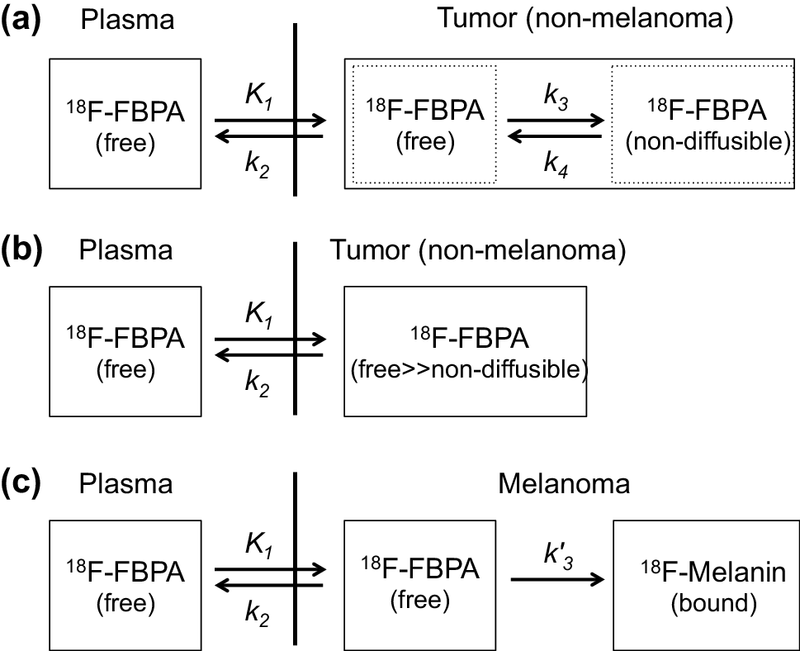 Estimating the 10B concentration by relative tumor uptake of 18F-FBPA against normal tissue and plasma has a certain practical benefit but does not predict possible adverse effects on the surrounding normal tissue by neutron irradiation. To avoid these risks the 10B concentration of the normal tissue should be estimated correctly. Recently, Shimosegawa et al. proposed a method to evaluate 10B-BPA accumulation directly in normal organs by 18F-FBPA PET before BNCT . They assumed boldly that 10B-BPA and 18F-FBPA behave in the body as the same compound even after different injection doses, and they calculated the 10B concentrations in organs by multiplying the relative accumulation of 18F-FBPA per g tissue by the therapeutic dose (g) of l-BPA. At present, this method has not been validated in BNCT. Thus far, 18F-FBPA PET has been utilized in 10B-BPA BNCT for patients with malignant brain tumors, recurrent tumors of the head and neck region, and malignant melanomas by many investigators (see reviews, [1, 2, 21, 22, 23, 89]). 18F-FBPA PET was a part of the inclusion criteria for BNCT clinical phase I/II trials of the treatment of recurrent head and neck cancers in Finland  and in Taiwan [91, 92]. In the Finnish study, 18F-FBPA PET was performed in 15 of 30 patients before BNCT and then in 7 patients after BNCT to evaluate treatment response. In the Taiwanese study, in 17 patients the T/N ratio of 18F-FBPA was > 2.5 as an inclusion criterion for one- or two-fractions of BNCT, and the treatment response was evaluated again by 18F-FBPA PET. As shown in the Finnish study, 18F-FBPA PET post BNCT is involved to evaluate the treatment response in the typical BNCT protocol. For this purpose, 11C-methionine PET was equally useful as 18F-FBPA PET [93, 94]. 18F-FDG PET, which is generally used to evaluate the efficacy of treatment of tumors, was also used successfully to evaluate maxillary sinus cancer invading into the orbital fossa after BNCT ; however, it should be noted that 18F-FDG accumulates in the inflammatory tissue post radiotherapy and normal brain. If PET diagnosis with more common probes such as 18F-FDG and 11C/18F-amino acids is applicable to the screening of patients to assess their suitability for BNCT, BNCT can be performed effectively. Nariai et al. performed PET with 18F-FBPA and 11C-methionine in 12 patients with malignant glioma on the same day, and found that the estimated T/B ratio of 10B after a 1-h constant infusion of 10B-BPA and T/B ratios of 18F-FBPA and 11C-methionine on static conditions showed significant linear correlations . Yamamoto et al. used both 18F-FBPA and 11C-methionine to evaluate 10B-BPA uptake in a BNCT trial of glioblastoma . Watanabe et al. also compared 18F-FBPA and 11C-methionine PET in seven patients with head and neck tumors with intervals of less than 3 weeks in six cases except for a 123-day interval in one case . They also described that 11C-methionine PET might be used instead of 18F-FBPA PET to select candidates for BNCT. However, 11C-methionine was taken up at higher levels than 18F-FBPA by tumors, as well as many normal tissues as a natural amino acid, and therefore, the T/N ratios would not be suitable for evaluating tumor accumulation in some normal organs such as the submandibular gland, liver, heart, stomach, pancreas, spleen, and bone marrow. Kurihara et al. also compared 18F-FBPA and 18F-FDG PET in 20 patients with head and neck cancers [98, 99]. A significant correlation was observed between maximal SUVs (SUVmax) of 18F-FBPA (4.13, n = 20) and 18F-FDG (9.40, n = 20), and an SUVmax of 18F-FDG ≥ 5.0 is considered to correspond to a T/N ratio of 18F-FBPA ≥ 2.5 as the threshold value for prediction of BNCT . Figure 4 shows representative images of 18F-FBPA, 11C-methionine, and 18F-FDG PET (unpublished data). The characteristics of the three probes are clearly demonstrated: a lower tumor uptake of 18F-FBPA compared with 11C-methionine and 18F-FDG and a high uptake of 11C-methionine in the normal salivary glands. In general, 11C/18F-amino acids such as 11C-methionine and O-2-18F-fluoroethyl-l-tyrosine are useful for the diagnosis of brain tumors, and 18F-FBPA is also useful, as described above. A benefit of artificial amino acids such as O-2-18F-fluoroethyl-l-tyrosine and 18F-FBPA is their very low uptake in the normal brain due to rapid clearance without metabolic alteration, although 11C-methionine accumulates in the normal brain to a certain degree due to the metabolic pathways of methionine. Consequently, it is considered that artificial amino acids give higher contrast tumor images than 11C-methionine. This is true when the T/B ratio of 18F-FBPA was compared to that of 11C-methionine in 12 patients with glioma on the same day . The ratio of 18F-FBPA was 1.61-fold higher than that of 11C-methionine, although the SUV of 18F-FBPA was 0.87-fold lower than that of 11C-methionine (personal communication). Miyatake and colleagues reported that 18F-FBPA PET is useful for differential diagnosis among radiation necrosis, pseudo-progression, and progression after BNCT for malignant brain tumors [100, 101, 102, 103]. They further described that both 18F-FBPA and 11C-methionine PET are equally useful for this purpose . 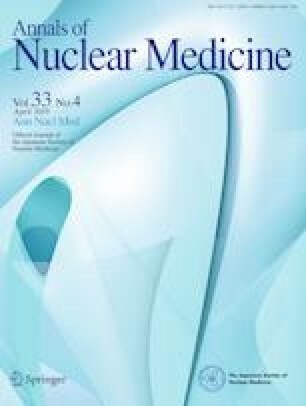 Prior to these studies, the usefulness of 11C-methionine PET for the differentiation of recurrent and radiation necrosis after stereotactic radiosurgery of malignant glioma was reported . Recently Beshr et al. confirmed the possibility of 18F-FBPA PET for the differentiation of recurrence from radiation necrosis in 12 patients with irradiated brain tumors. The four parameters investigated were mean SUV, SUVmax, metabolic tumor volume, and total lesion uptake, and their ratios of recurrence to radiation necrosis were 2.5, 4.2, 3.8, and 9.8, respectively . Differential diagnosis between inflammatory lesions and tumors by 18F-FBPA PET was suggested from an animal study ; however, no clinical studies have been reported to date. As described in section “Tumor accumulation of 18F-FBPA and PET imaging”, melanomas in animal models showed higher uptake of 18F-FBPA than non-melanoma tumors, probably due to the trapping mechanism of 18F-FBPA in melanogenesis. This melanoma-preferential uptake of 18F-FBPA was confirmed clinically by Morita et al. . 18F-FBPA showed a slight washout pattern in squamous cell carcinoma of the head and neck (n = 20) and a persistent pattern in malignant melanoma (n = 8). The melanomas-to-squamous cell carcinoma uptake ratios of 18F-FBPA increased slightly (1.69, 1.73, and 1.93) with time post-injection (30, 60, and 120 min, respectively). 18F-FBPA has been developed for monitoring the pharmacokinetics of 10B-BPA used in BNCT and characterized as a 10B-BPA probe in basic studies in vitro and in vivo of tumor imaging potential, transport, cellular distribution, metabolism, validity, and reliability. Tumor uptake of 18F-FBPA depends mainly on transport by LAT. Tumoral distribution of 18F-FBPA was primarily related to the activities of DNA synthesis and melanogenesis. Pharmacokinetics of 18F-FBPA reflects mostly that of BPA, although there are slight discrepancies between the two compounds. Clinically, kinetic analysis based on 18F-FBPA PET has successfully estimated the 10B-concentration in tumor tissues, and the significance of 18F-FBPA PET in 10B-BPA BNCT has been established. 18F-FBPA PET has been involved in the practical 10B-BPA BNCT for the treatment of patients with intractable tumors and used for screening of patients, prediction of the distribution and accumulation of 10B-BPA, and the evaluation of treatment. Static 18F-FBPA PET scans are generally used to measure the T/N and tumor-to-blood ratios of 18F-FBPA. However, it has not necessarily been clarified whether PET findings predict the prognosis of BNCT. Furthermore, recent studies have suggested that 18F-FBPA PET could be used more elaborately for successful 10B-BPA BNCT. Apart from BNCT, 18F-FBPA is considered to be a useful PET probe for tumor diagnosis; however, for general diagnosis in nuclear medicine, the third-generation synthesis of 18F-FBPA by nucleophilic fluorination using 18F-fluoride that will enable higher activity amounts and higher molar activities, is required. The author thanks Dr. Kazuo Kubota and Dr. Katsumi Hirose at the Southern TOHOKU Research Institute of Neuroscience for valuable discussions. The author would like to thank the Japanese Society of Neutron Capture Therapy for granting the author the Mishima Memorial Chemistry Award in August 2016. Funding was provided by Japan Society for the Promotion of Science (Grant-in-Aid for Scientific Research (B) no. 16H05396). Department of Biofunctional Imaging (Kiichi Ishiwata) at Fukushima Medical University is endowed by Southern TOHOKU Research Institute for Neuroscience.